Next month we'll have another bad law to fight and another badly behaved site to block. Meanwhile, piracy of software, video and music will continue regardless. I used to think that the answer to piracy was to jail all taxi drivers. That isn't anti-taxi prejudice; it's that for a long time every taxi I've taken has been driven by a pirate. "What do you do for a living, mate?" the driver asks. I write about technology, I reply. "Computers and that?" Yes. There's always an "ah", then a pause, then 16 minutes of intensive interrogation about the best software and codecs for transcoding dodgy downloads. If you think that sounds dull, imagine doing it when you're as drunk as a lord and so tired you can barely see. The taxi drivers, like most downloaders, didn't see what they were doing as a crime. They're doing it, they say, because movies are so expensive. It's hypocritical, though - if I'd legged it from their cab without paying, I doubt my claims of "But you forced me to do it because your fares are so high!" would carry much weight. But that hypocrisy partly explains why the pressure for bad laws and ridiculous censorship continues to grow. I was talking to somebody the other day about piracy, and they explained why they'd pirated a game. They didn't want it on DVD, they told me, so they went to look for it digitally. It wasn't available in the download shops the person tried, so he headed for the torrents and downloaded a ripped version. "I was forced to download illegally," he told me. "I seriously wanted to pay and download but had no choice." That, clearly, is nonsense. Of course there's a choice. Take PC games, for example. You can buy them new in shops, or you can go online and find them cheaper. You can wait until they turn up in the pre-owned ranks, or on eBay. You can buy them on Steam, or rent them from LoveFilm, or just hang around until the price drops: as I write this, the hilarious and overlooked Bulletstorm on PC is £10.24 new on Amazon, or £8.20 used. If none of those options suits, you still have a choice: you can buy something else, or you can hold onto your money. Forced to download? Oh, come on. Where exactly do videogames and Hollywood movies figure on Maslow's hierarchy of needs? You aren't stealing bread to feed your starving family here, or fighting repressive censorship. You're just trying to get free stuff. When I was young, a truck full of chocolate bars lost its load a few streets from my house. By the time the police turned up - which was, annoyingly, long before I found out about it - the cargo had gone. People didn't take the chocolate because they were forced to; they took it because, hey! Free chocolate! The rewards were so attractive and the risk of being caught was so remote that half the town went on a three-day Wispa binge. When you hit the torrents you're doing exactly the same thing, albeit with less damage to your waistline, so when anti-copyright activists claim every downloader's a freedom fighter it plays right into the entertainment industries' hands. 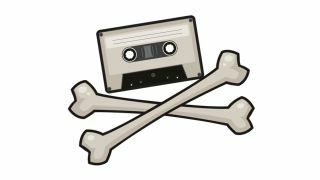 When we claim we're forced to download, we're telling regulators that no amount of legal options will stop piracy, so they might as well censor and legislate the hell out of the net. I know that you know this. So what are we going to do about it? Don't worry. I have a plan. It's simple. We're all going to start telling the truth. Buy shares in firms that make sodium pentothal - we're going to need a lot of it. Here's how it would work. Imagine the head of a global entertainment firm taking the mic at a court hearing about a ridiculous piece of proposed legislation. "We have done everything to stop piracy! You must close all of the internet we don't like!" he says. "Is that so?" the judge asks. "Inject the truth serum!" There is a hiss, and then a pause, and then the executive speaks again. "OK!" he admits "There's no real reason why our films can't be on Netflix sooner! We know every download isn't a lost sale! We wouldn't exist if the copyright laws we demand now existed 50 years ago! We are scared of internets!" "No new laws for you!" says the judge. "Next!" A 19-year-old man takes the stand. "I download because The Man forces me to with his high prices, his region coding, his DVD release windows and his unskippable Blu-ray piracy warnings!" "Really?" There is a hiss, and then a pause, and then the 19-year-old speaks again. "I download because I'd rather spend my cash on a new graphics card and Wotsits!" "Marvellous. No freedom from ISP traffic shaping for you, young man!" And so on. There has to be a way to fix this - to crack down on the for-profit pirates without unduly inhibiting our freedom to do what we want online, but we can't have a debate if both sides insist on telling porkies.